I've been baking a lot. Bread, that is. Early in July, I revisited the "Artisan Bread in Five Minutes A Day" technique, and I just couldn't stop after that. I already liked it when someone taught me in 2008, but this time I have the book, and it is a gem. You can turn out all kinds of breads, bagels, flatbreads and pizzas, enriched breads and pastries, etc. What I really like about the basic bread recipe is the crust. Oh my! 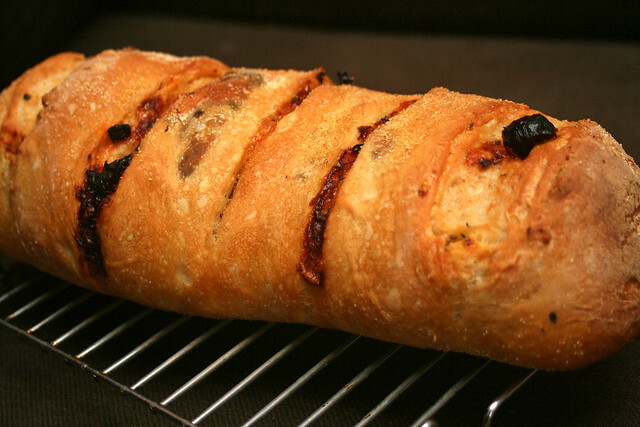 If there's anything I love more than crackling roast pork skin, it's crackling bread crust. And how it sings when it comes out of the oven, crinkling as it cools. 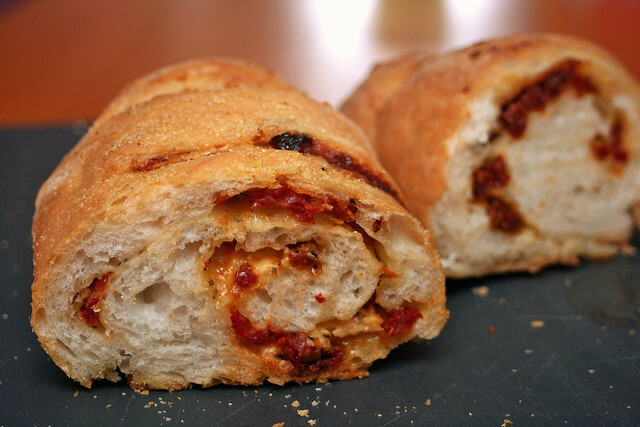 Last week I tried the Sun-dried Tomato and Cheese Bread, which is an extension of the basic bread formula. 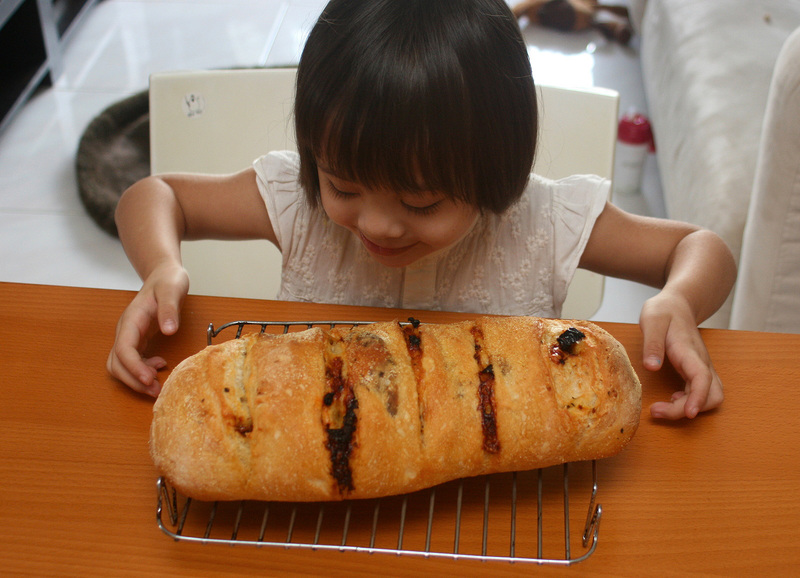 Anyone can make this, without kneading too. Make sure water is slightly warmer than body temperature. This helps initial rise to be just 2hrs instead of 3 or 4. Mix in the flour - no kneading necessary. Dough should be uniformly moist. Cover with lid (not airtight) and allow to rise (about 2hrs). Longer periods are OK too. You can use a portion of the dough after this, but fully refrigerated dough is less sticky and easier to shape. That's the basic dough recipe, which you can use to make boules and such. On baking day, dust the surface of the dough in the container with flour and cut off about a grapefruit size. Dust the piece with more flour and quickly shape it into a ball (stretch surface of dough around to the bottom on all four sides, rotating as you go). Roll out the ball into a quarter-inch thick rectangle. Use enough flour to prevent it from sticking to the work surface but not so much that it's dry. Brush the dough with olive oil. Scatter the chopped tomatoes evenly and sprinkle the cheese all over. Starting from the short end, roll up the dough into a log and gently tuck the ends under to form an oval loaf. Allow to rest an hour. The book calls for a pizza peel and baking stone (hence the cornmeal for dusting the pizza peel), but it's fine to just use a parchment-lined baking tray. I still let the dough sit on a slight dusting of cornmeal on parchment for that nice gritty effect. Brush the top of the dough lightly with olive oil and slash parallel cuts across the loaf, using a serrated bread knife. Place the bread (on baking tray) into the oven. Pour one cup of hot water into a small tray or metal container and put that into the oven as well (but note that tabletop ovens may not be able to handle this extra steaming). I put it on the oven floor, which I was recently told is not advisable (try the lowest rack instead). Or you can use a broiler tray that does not interfere with rising of bread. Bake for 30-35 minutes or until deeply browned and firm. Allow to cool before slicing or eating. Yes, we all want to carve right into warm bread fresh out of the oven, but let it cool first, or the inside may still be partly gummy.